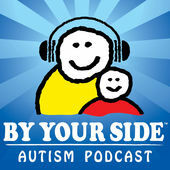 Welcome to the BY YOUR SIDE Autism Podcast! BYS - Autism Therapy Services podcast can be heard on the first and third Monday of every month. The podcast is an interview show featuring open and honest conversations with therapists, parents, educators, authors and experts from the autism community. BYS provides therapeutic services in three different environments (in-center, in-home, school-based) in Northern IL offering ABA, Speech and Occupational Therapy. The BYS podcast topics include therapy tips, coping skills, ideas, strategies and candid conversations from parents who live with autism in their lives. We have always known that parents who have children on the spectrum are special people. Yet, we sometimes forget that our parents are facing battles outside of the autism world. Anna Kalinowski-Kluzik is a single mom, has two children on the spectrum, and is currently battling cancer. She talks about her love for life, her love of music, and her love for her children. A true inspiration. Brett Balduf is the younger brother of BYS’s President Brad Balduf. Brett is the principle at Carpenter school – grades K through 5th - in Park Ridge IL. Mr. Balduf’s career started as a social worker and he has always been a proponent of rethinking how we look at education. He has great insight for any parent looking for best practices educating their child both at school and at home. In this episode we discuss: Do grades and classrooms designs need to be rethought? Why kids needs goals. Mr. Balduf gives an insight to the teachers of today. We discusses fidgets, standing desks, and more. Garret and MaryAnne Mathews give an honest look into their marriage of 38 years with Garret recently finding out he's on the spectrum. In what ends up both answering questions and yet bringing up new questions. They use this recent discovery to try and help others who may going through a similar situation. Six BYS therapists went to the official SibShops training where they learned how to facilitate a workshop for kids who have a sibling with special needs. Hear these therapists talk about what kids can expect during the workshop, the benefits of giving these kids their own time, and first-hand accounts of being someone who has a sibling with special needs. Leslie Shook has worked as the theatre manager for The DePaul Theatre School in Chicago since 1982 and is responsible developing audiences of more than 35,000 people at DePaul’s Merle Reskin Theatre each season. One show of DePaul’s Theatre School’s production of Cinderella was turned into a sensory friendly performance. Leslie talks about theatre and it’s importance to children, plus she discusses what goes into and what can be done with sensory performances. Brian Katz, BCBA, breaks down in detail an article about gaining instructional control from your child. Brian talks about methods and prompts that will help parents with their child to act more independently. He focuses on the concept of positive parenting. A must listen for those seeking guidance in getting their child to respond to their requests. Dr. Grandin’s passion is in full force as she clearly defines what parents and kids need to be doing and how to prepare for the next stage of their lives. Her philosophy of “Mentors are attracted to talent” offers as a great reminder of getting kids “doing” things that fit their ability. Brian Katz and Matthew Zaffos are both BCBAs at BY YOUR SIDE. In this week’s episode, they discuss their strong views on topics such as, parent training and early intervention, and explain how they are passionate that these are the keys to a child’s success. This week, we speak with two BY YOUR SIDE Speech Language Pathologists; Natalie Halm and Susan Theis. They discuss the importance of playtime as a family and how the Speech Pathologists work with the ABA team to tackle some of the issues. We do something a little differently in today’s episode. We review with a behavioral specialist, the interview we did with Andrew Blaha, a teenager on the spectrum. Anita and I break down what Andrew talked about and we discuss it from a professional angle. Andrew discusses the difficult topic of bullying in this interview as a teen with autism himself. He also discusses how help at school literally changed his life from anger to one with knowledge and comfort. Our first interview with someone on the spectrum and it offers some great perspectives on growing up with Autism. Andrew Blaha is a 19 year-old on the spectrum. He offers insight through - what he calls - his lens. Laura is a BCBA at BY YOUR SIDE. She received her M.A. in Clinical Psychology, specializing in Applied Behavior Analysis, from the Chicago School of Professional Psychology in 2010. Laura’s interest in working with individuals with developmental disabilities started at an early age. Nick and his wife Sinead have a daughter named Emma who is on the spectrum. For about two years now Nick, along with one of his improv partners Molly Fisher, have been teaching improv classes to people who are on the spectrum. Samantha is the Sr manager of OT at BYS. She holds a Masters of Occupational Therapy from The Ohio State University. Sam talks about areas of therapy most people don’t know OT’s can do. She gives tips and ideas about everyday household items that can be turned into OT activities. Caitlin Dalton is a certified special education teacher who has her Master's in ABA. Before working at By Your Side as a behavior specialist, she worked as a teacher in both public and private autism classrooms. Caitlin has a passion for educational rights and teaming with local school districts. BYS 015 Julie Stretch: Parent of a child on the spectrum talks about how they found ABA. Julie has recently been on both sides of her understanding of ABA therapy. The before, where her son didn’t start yet and she was researching if it was the right fit. And the after, seeing firsthand what ABA can do. Julie walks us through the good and bad of what she heard and ultimately the positive results she sees in her son. BYS 014 Senior Manager of ABA Ginny Nikiforos, LCSW & BCBA talks about: What is ABA? ABA is not only a therapy model for the child. An effective ABA plan includes a team of people: child, parents, siblings, teachers, therapists. Ginny explains the team concept of ABA and how it works, how it’s performed, and how it’s a team effort as parent training, supervision, and assessment are all part of the ABA plan. An emotional and a poignant interview with three of BY YOUR SIDE’s ABA therapists, each who have a younger brother with autism. Alex, Lizzie, and Natalija give their insights to being in a profession that hits close to home. Lianne Paterson is a parent with a child on the spectrum and gives an open look into how her son's diagnoses changed her as a person, parent, and wife. Lianne's insight into her world ranges from dinner time, damaged furniture, and sleepless nights. Preparation is your friend. Katurri walks us through an example of dealing with a situation where you go to the grocery store and your child is not ready to come out of the car. Katurri goes into specific details on how to handle difficult behaviors when it comes to a child needing guidance going places. The BYS Community Outreach Team - Tom Trimingham, Nimra Irfan, and Kimberly Childs talk about what it is like working for a therapy services business in a non-therapist role. They discuss what surprises them, what they have learned, and how they work within the local community to help spread the message about the value of the different therapies that BYS offers. Sandie Beierwaltes has been teaching elementary school for 29 years at St. John Brebeuf in Niles IL. Sandie and her husband Dave have three children. Their youngest son Michael is on the on spectrum. Michael is now 15 and the Beierwaltes’s have been on this journey for over a decade. Sandie shares the challenges and the joys that they experienced along the way. What common characteristic of autism are parents and doctors quick to dismiss? In episode number eight, we have the pleasure to talk with Karen Kabaki-Sisto, M.S., CCC-SLP. She has been helping children with autism all over the world for 20 years. Karen is the founder of Autism Breakthrough Solutions and creator of “I Can Have Conversations With You!™”, an interactive iPad program that enhances social skills and language abilities. Sarah is a licensed and board certified occupational therapist. Since graduating from Saint Ambrose University she has worked with children in outpatient clinics and schools. Sarah is one of our therapists in both the school and our clinic. Cindy has a 9 year old daughter who has been dealing with seizures her whole life. Cindy talks about a very scary moment in the middle of the night where her daughter was having an episode, and a touching insight when her other daughter wrote a paper for school about her sister seizures, a feeling Cindy never knew until she finished reading the assignment. Julie Martin is the center director, as well as the lead SLP and BCBA, of BY YOUR SIDE autism center. In this episode, we spend the full podcast discussing why it’s sometimes difficult for a child to transition from one place to another and tips on how those transitions can be made easier. The conversation moves into the topic of change, which as Julie points out, is the same as transition, yet can have its own set of challenges. BYS 004 - Eunice McConville- Parent of a child with autism. Eunice has been taking her child to BY YOUR SIDE for over 4 years and has become the parent that we send other parents to talk to if they have questions about having a child of the spectrum. Eunice tells us of her low points and how community involvement has been one of the best moves she’s made. Theresa is a certified licensed Speech-Language Pathologist holding a Master’s of Science from Governor’s State University. Prior to working at BY YOUR SIDE Theresa gained extensive experience working with children with a variety of speech-language disorders including Autism in both public and private school settings. Theresa has received training in PECS, Kaufman Protocol for Children with Apraxia, Stanley Greenspan’s Floortime/DIR model, and S.O.S. feeding. Jen starts the show with a story of her neighbor’s misguided attempt of "helping" by calling DCFS on them, an act that could lead to having Jen’s children taken away. Jen discusses not being afraid of putting it out there that your child is on the spectrum. How her group of friends became smaller, but how smaller is better. And Jen gives us honest insight to why she has a difficult time reading success stories. Julie Martin is the center director, as well as the lead SLP and BCBA, of BY YOUR SIDE Autism Center. In today’s podcasts, Julie covers basic topics about how a BCBA's job is finding out the “why” in the Child's behavior and what is happening when a child with autism is having a meltdown. Julie also leaves us with a tip on what parents can be doing more of with their child. If you have a chance, please leave us an honest rating and review on iTunes by clicking this link. It helps the show and its ranking in iTunes which helps us create more shows! We appreciate it! Enjoy the show!